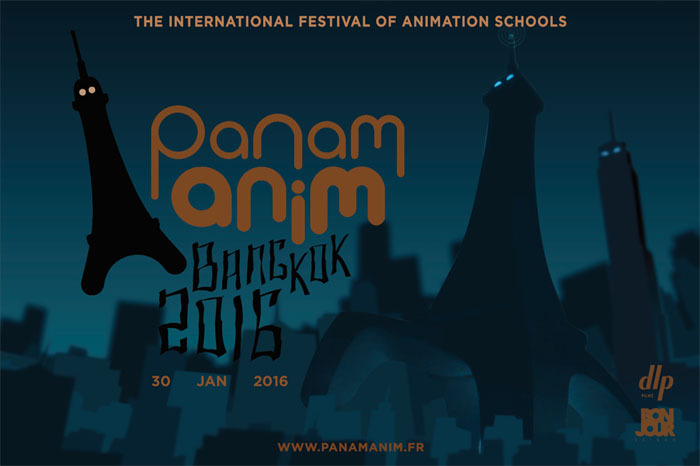 We are very proud to welcome to Thailand Panam Anim, The International Festival of Animation Schools, created by Pascal Chinarro 5 years ago in France. The 1st edition of Panam Anim Bangkok is organised in partnership with the Bukruk Animation Night that is also launching its 1st edition during the Bukruk Urban Arts Street Festival 2016 on Saturday 30 January. Panam Anim takes place every year during the winter in Paris since 2011 and at springtime in Shanghai since 2013, where the Chinese students have competed with much success to their French counterparts. Each year new schools from different countries join the festival and Panam Anim is on its way to become the major international appointment animation students and industry professionals. We hope many Thai animation schools will be joining very soon the international selection of the festival. For this first edition, Panam Anim Bangkok will be screening a selection of 16 award-winning short films from the past 5 Parisian editions, presented by its president Pascal Chinarro. The night will go on with a rich programme put together by French artist Florence FLOKIM Lucas, festival partner and curator of Bukruk Animation Night. To continue the evening Maythee Nojinda and Yuree Kensaku will be presenting 12 Cats rock concert and a video performance. n the second part of the night, we will screen Fantastic Planet, a 1973 cutout stop motion science fiction film allegorical film directed by René Laloux and production designed by Roland Topor known for its surreal, psychedelic imagery. The night will then go on until late with few artists films and a bunch of innovative and crazy animated music videos. Panam Anim Bangkok is organized by and in partnership with Bukruk Animation Night.